The game starts with a 10 x 10 grid, with the ten rows and ten columns labeled with the numbers 0 through 9. One team is designated as the “rows” and one team as the “columns.” The bettors take turns putting their initials in each square until all the squares are filled. After each quarter, the last digit of each team’s score is taken and the player with the corresponding square in the grid wins for the quarter. For instance, if the score was 17-14 in favor of the “rows” team after the first quarter, the player that picked the square “Row 7, Column 4” would get a certain amount of the money. Traditionally, the predictor of the first quarter gets 20% of the money, the predictor of the halftime score gets 30%, the predictor of the third quarter gets 20%, and the person that predicts the final score gets the last 30%. So, using these weights, what is the optimal strategy, and which numbers should you stay away from? As the graphic shows, predicting favorite-digit-7 and underdog-digit-0 has been the optimal strategy, with an average payout of $82.74. Assuming each square costs the same amount ($10 in our case), there are only 24 squares that have yielded a profit on average. In fact, there are five squares whose scores have never materialized in any quarter of any game in our sample. So as you prepare for Super Bowl Sunday, make sure that you bring our chart with you to your party, along with your chips and salsa. After all, losing’s for squares. In no way does this account for the random distribution of ending digits (via playing cards/numbers out of a hat/etc.) Additionally, the squares are generally paid for before the numbers are assigned, thus eliminating the (not terribly difficult to master) strategy of picking the most obvious/likely numbers. If this were not the case, there would be little to no reason for anyone to buy squares after the most likely ones have been taken. This is a good point. I don’t think I’ve ever played where I actually got to choose the square after I saw the numbers. But interesting nonetheless! I do enjoy quantifying things to confirm my suspicions. 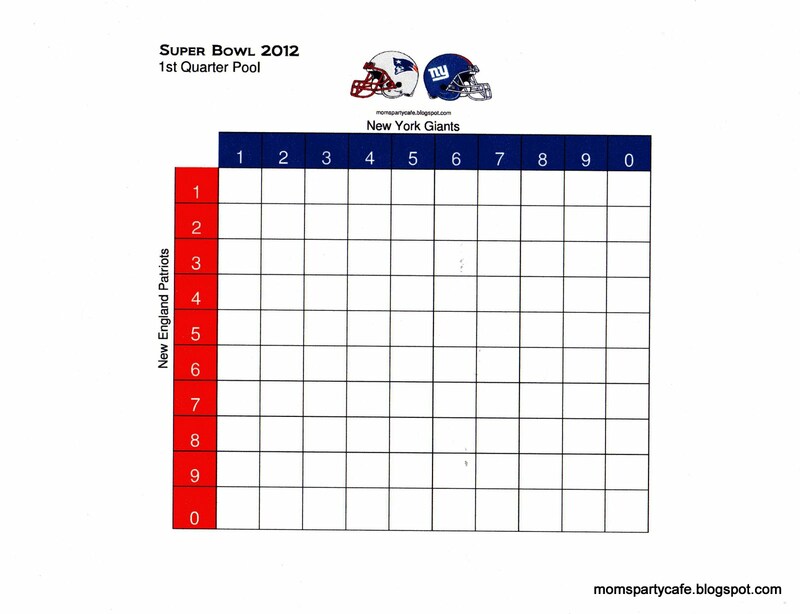 This is not how superbowl squares are done. You pick your boxes first and then the corresponding numbers along the rows and columns are picked afterwards at random after everyone has chosen their boxes. If you played the way you’re suggesting, some boxes would have to be bought at a premium over others. Obviously some combination of numbers provide you with a greater statistical chance of winning over others. Though, this is not the way squares are played so this does not provide you with any strategy at all. If there are in fact alternate ways of playing, I’m assuming some boxes are obviously more expensive than others? You’re right, if the squares (or digits) are randomly assigned to you then there really is no strategy for playing since everyone has the same odds once they buy into the game. However, there are some pools in which you buy into the game, and then there is a draft where you can choose your square in turn. In this latter type of game, you can use this chart to maximize your expected payout. 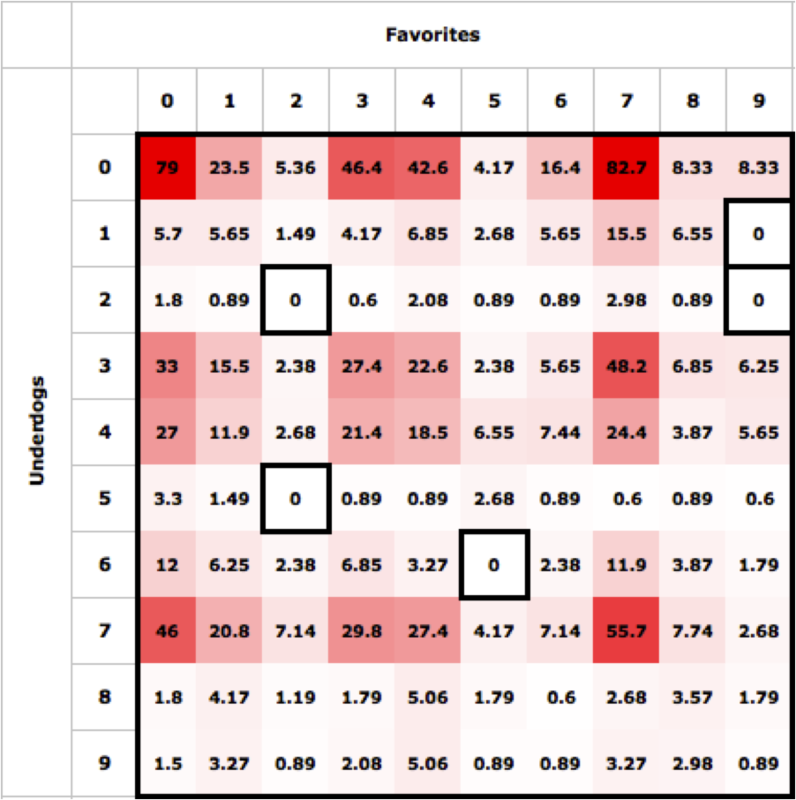 We didn’t set out look for your odds of winning based on the randomization of digits, but instead we tried to figure out which squares historically had the most success. Also, it’s worth noting that only 24 of the 100 squares provide you with expected profit (from a $10 buy in), so that might affect your decision to play the game at all. If nothing else, this chart will at least let you know what you can expect to win once your square has been assigned to you in a randomized game. Well said. Rules may differ, but the information is valuable for many reasons. All right, Squares truthers, but the basic point remains the same: these are the payouts for each combination of numbers, which is certainly valuable information. Similar to the 20/30/20/30, favorite 7 underdog 0 has the most expected value, followed by 0-0 and 7-7. If you leave your twitter handle I will PM you the chart. I’d be curious about the raw data as well, prior to adjusting for payout. Or an adjusted chart for a pool where the payout is 20-20-20-40. I don’t have a twitter handle, but you can email me at robdarby3[at]gmail. Thanks for the info! There IS a strategy for Squares in which the numbers are filled in after you’re finished. And that strategy is to diversify. Don’t put more than one box in a single column or row. See, Bill’s comment is what I was hoping this would be about. Say I am willing to buy 5 or 10 squares. How should I group them to improve my odds of at least breaking even? A diagonal? A box? A line? Two lines? To my knowledge, if you are buying multiple squares, putting them all in different rows and columns will not change your expected winnings, but will reduce your standard deviation of winning. But I could be wrong, it could quite possibly be the opposite. I would think a diagonal line would increase your odds of winning (because it gives you the highest diversification), and putting them in a straight line (horizontally or vertically) would lower your odds of winning (because you will have the same numbers on one side), but increase the possible AMOUNT of money you’d take in should you win. I prefer the former. Low-risk, low-reward. This guy is an idiot and has no idea how the squares pool works. I would agree with Mooneyar that this information is useful in knowing the probability of your number combination winning, after the numbers are drawn, even if random. The post is very useful. The strategy is so good. I liked it very much. Thanks for sharing! The post is very useful and interesting, I learned a lot from it. Thanks for sharing!